Books and Movies | Armchair General Magazine - We Put YOU in Command! If you are looking for a good, comprehensive, single-volume biography on Napoleon, this is the book to read. Wayne Vansant cranks up the dramatic tension a notch or two in "The Battle of the Bulge," the latest in his well-researched, graphic novel–style history series from Zenith Press. "My Pearl Harbor Scrapbook 1941" packs a wealth of information into a small amount of space, and every page is lavishly enhanced by reproductions of World War II memorabilia. "The Medal of Honor: A History of Service Above and Beyond" tells how the medal originated and provides many fascinating stories of recipients from the Civil War to the present day. Leon Panetta's "Worthy Fights" covers a broad spectrum, including how government operates, complexities of modern international relations and Pentagon planning, and insider information on the war against terrorism. 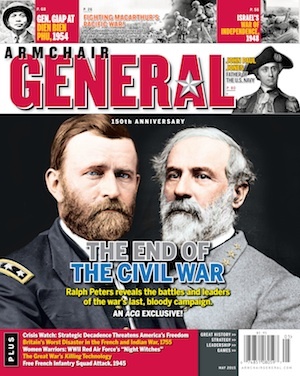 Civil War buffs and ghost story fans could certainly do worse than curling up with "Ghost Soldiers of Gettysburg" and a bowl of trick-or-treat candy on Halloween. "The Presidents’ War" by Chris DeRose studies how the five living presidents of the time reacted to Abraham Lincoln and the Civil War. "Lion Rampant," a book of sergeants and privates fighting, living, suffering, laughing and dying at the tip of the Allied spear, is Robert Woollcombe's engaging memoir of his WWII experiences with the King’s Own Scottish Borderers. "The Hornet's Nest" utilizes powerful combat footage and crisp storytelling to take viewers to the front lines of the war in Afghanistan, while also capturing the humanity of US troops, Afghan civilians and a father-son photojournalist team. In his latest graphic novel–style history, "The Red Baron," Wayne Vansant takes to the skies of World War I to tell not only the story of Manfred von Richthofen, aka The Red Baron, but of the development of aerial warfare. In "The Return of George Washington" historian Edward J. Larson disproves the myth that Washington only reluctantly returned to public life to become president of the new country. 'Lincoln's Bishop,' by Gustav Niebuhr, tells the little-known story of Henry B. Whipple, Minnesota's first Episcopal bishop, who tried to convince Lincoln to reform the Office of Indian Affairs and tried to calm white hysteria in the wake of the Sioux Uprising of 1862. "The Sleepwalkers - How Europe went to war in 1914" is a book anyone seriously interested in how World War I started needs to read. In "The Great War for Peace," William Mulligan rejects the view that WW1 was simply a slaughter that led to WW2 and argues it was critical in creating a new world order focused on peace. "The Americans on D-Day" is a terrific photographic history of the American experience before, during, and after the D-Day landings. The accompanying text blends personal narrative, small-unit combat, and more into a cohesive whole. "Firearms: An Illustrated History," produced by a partnership between The Smithsonian and Dorling Kindersley (DK) Publishing, is a coffee-table book guaranteed to provide several evenings’ worth of entertaining reading to any gun or history enthusiast. Steve Vogel’s "Through the Perilous Fight," is an informative and interesting work about when British troops burned Washington and bombarded Ft. McHenery. It also follows the path "The Star-Spangled Banner" took to becoming the national anthem. Romulus Hillsbourgh’s "Samurai Revolution" examines the pivotal late Edo and Meiji Periods of Japanese history, when the Western world injected itself into isolationist Japan. It is also serves as a warning for America today.